There will be no arguments, no complaining, and definitely no temper tantrums. The only acceptable reaction is quiet distemper, with a heaping side of malicious mischief. Strange Mercy, St. Vincent's forthcoming third album, is all of those things, and because of its epic, complex, multi-layered awesomeness, you will listen to it and you will buy it. It is a commandment. And it's also in the title. Strange Mercy is an album throughout which, to her greatest ability thus far, Tulsa's Annie Clark combines the austere creepiness of noir fantasy with pure vocal and melodic beauty. On one hand, this new album is her strangest, her darkest and her most directly lamentative, but it's also her most enlightened, most sweepingly arranged and most brilliant. Strange Mercy hearkens back to some of the softer side that made 2007's Marry Me so revelatory, lightening up on the grungy guitar rasp of 2009's Actor. But where Annie Clark cuts back on the heavy sounds, she fills in with tone and mood accents that up the creepiness as necessary, and in turn, exponentially up the tension between horror and beauty, strange and merciful. Opening with the hypnotizing, unsettling "Chloe in the Afternoon," Strange Mercy sets its psychologically weighty tone immediately. But it's with "Cruel," and its video appeared here just a short while ago, and "Cheerleader" that the beauty-horror meets best with complex harmonies, pristine vocals and themes that stagger and mystify as they entertain. On the former, Clark sings of the abuse that lies in not valuing oneself, letting oneself be taken and then taken advantage of. On the latter, easily my favorite track after two listens, she intones "I don't want to be a cheerleader any more," in haunting, gorgeous tones. The ante is upped once more with "Surgeon" and the building, energetic and boil-over-into-electronics beauty of "Northern Lights." 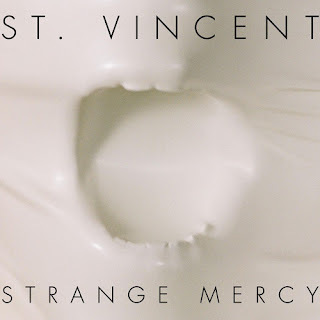 What's clear, through the first half of Strange Mercy is that St. Vincent is no longer just an idea about making palatable indie rock that's a little unsettling. It's now about making unsettling rock that is undeniably palatable... even lovable. "Strange Mercy" reins the chaos in a bit, with a synthy, echoing track that is half love letter, half ransom note. Even as Clark's beautiful vocals say wonderful things, there's a hint of danger, especially when she speaks of what she'll do if she ever "meet[s] the dirty police man who roughed you up." On "Neutered Fruit" a choral beginning turns quickly to a feeling of ghosts moaning in the darkness. The guitar, with some especially strong riffs, comes through most here. "Champagne Year" has a very Leonard Cohen quality, but with another point of dark self-reflection as Clark sings "I make a living, telling people what they want to hear." The rest of the song is spent qualifying that choice, slowly, sweetly, but somewhat desperately. "Dilettante" is more direct, with crunchier guitars and a stronger rock vibe. With a jaunty, wobbling beat, "Hysterical Strength" lives and dies by fuzziness and a sense that there's nearly a olde timey piano fight about to occur, in ghost town. But it's on "Year of the Tiger" that St. Vincent really knocks everything out of the park. A heavy bass drum breaks down to a very beautiful acoustic guitar strum that while spare feels powerful and complete. Moments like these, where an album diverges from most of its previous sound, make me wonder if it's a hint of things to come. It's a beautiful song. Strange Mercy is available for a limited time through NPR's First Listen. You can also pre-order it through the official Beggars Group website. I suggest you do both.